It was now the late fifties, jobs were scarce in Jamaica, so Bob followed his mother from their home in St. Ann to Trenchtown (West Kingston) to seek employment in the big city. Trenchtown got it's name because it was built over a ditch which drained the sewage of old Kingston. In Trenchtown Bob spent a lot of his time with his good friend Neville Livingstone who people called by his nickname, Bunny. Also in the big city Bob was more exposed to the music which he had loved, including such greats as Fats Domino and Ray Charles. Bob and Bunny attended a music class together which was held by the famous Jamaican singer Joe Higgs. In that class they met Peter Macintosh and soon became good friends. In the meantime Jamaican music evolving and became very popular throughout the Caribbean due to it's invention of Ska music. When Bob was 16, he started to follow his dream of becoming a musician. Music to many young Jamaicans was an escape from the harshness of everyday life. One of those kids was Jimmy Cliff who at the age of 14 had already recorded a couple of hits. After meeting Bob, Jimmy introduced him to Leslie Kong, a local record producer. Bob followed his advice and auditioned for Leslie Kong. Bob's musical talents shone much more brightly then anyone else that day and found himself in the studio recording his first single "Judge Not". Unfortunately neither "Judge Not" nor his 1962 single "One more cup of Coffee" did very well. Bob soon left Kong after she failed to give him his pay. The following year Bob, Bunny and some other friends formed the Wailing Wailers. The didn't get off to a great start, after just a couple recording sessions two members, Cherry and Junior Braithwait left the band. The band continued on and were introduced to Clemet Dodd, a producer of the record company Coxsone. It was here where the Wailing Wailers recorded the first song "Simmer Down" which did quite well in Jamaica. To help with the recording of their songs the studio provided several talented Ska musicians. The Wailing Wailers consisting now of Bob Marley, Peter Tosh and Bunny were starting to become quite popular locally. Their audiences rapidly grew and they recorded several more songs on the Coxsone label which included "It Hurts to be Alone" and "Rule the Roadie" Bob soon took on the role of the leader, being the main songwriter and all. Bob's life continued to look more bright on February 10, 1966 when Bob Marley married girlfriend Rita Anderson. The next day Bob left for the United States to visit his mother who lived in Delaware. While in the US he worked to better finance his music and soon returned home. When Bob Marley returned the Wailing Wailers' music evolved from Ska to Rock Steady. This evolution conflicted with Coxsone who wanted a Ska band. So the newly Wailing Wailers left Coxsone to form and renamed themselves the Wailers. Instead of looking around for a new label the Wailers decided to form their own which they called Wail 'N' Soul. This coincided with the birth of the Marley's first born who they named Cedalla. They released a couple signals on their label such as "Bend down low" and "Mellow Mood" before it folded the very same year. The ending of their label affected the band greatly, it wasn't until they met Lee Perry that they got back on track. With the help of Lee Perry the Wailers produced such great tracks as "Duppy Conquerer", "Soul Rebel", "400 Years" and "Small Axe". 1970 saw the Wailers family grow with the addition of Aston "Family Man" Barret and his brother Carleton. The Wailers were now quite popular throughout the Caribbean but still internationally unknown. With this popularity a second more successful label was formed by the Wailers called Tuff Gong after a nickname of Bob Marley. The Wailers met Johnny Nash and soon Bob accompanied Nash to Sweden and London. When in London, Bob recorded "Reggae on Broadway" which was released by CBS. After this the rest of the Wailers arrived in London to help promote the single only to find that there were out of money and stranded there. With little options available, Bob went into the Island Records Basing Street Studios and asked to speak to the boss, Chris Blackwell with hopes of a possible record deal. Mr. Blackwell had already heard of the Wailers and signed them on the spot. He advanced them eight thousand pounds so that they could fly back home and record their first album for Island. This was a massive deal, for the first time a reggae band would have access to the finest recording facilities. The album they released was "Catch a Fire", it was very well received by critics and was one of the first reggae albums. Before the Wailers reggae was sold on signals or compilation albums. In the Spring of 1973 the Wailers arrived back in London to kick off their three month tour of Britain. At the conclusion of the tour they returned back to Jamaica where Bunny decided to quit touring. He was replaced by Joe Higgs. The Wailers along with Higgs travelled to the US were they were scheduled to open 17 shows for the number one black act in the States, Sly and the Family Stone. The Wailers were fired after 4 shows because they were more popular then they band the opened for, the crowd often chanted "Wailers" well into the Sly and the Family Stone set. Also they opened a couple dates for Bruce Springsteen. After Sly and the Family Stone axed the Wailers they found themselves once again without money and stranded, this time in Las Vegas. Somehow they found their way to San Fransico. While there they did a live concert broadcast for the radio station KSANFM. The whole experience boosted their popularity in North America. With 1973 winding down the Wailers released the much anticipated follow up album to "Catch a Fire" called "Burnin". On this album many Wailer classics appear such as "I shot the Sheriff" and "Get Up Stand Up". The Wailers popularity in North America grew even more when Eric Clapton rerecorded "I Shot the Sheriff", becoming a number one hit on the US singles charts. 1975 saw the release of the Wailers's third album, "Natty Dread" with such great tracks as "Talking Blues", "No Woman No Cry" and "Revolution". On the down side though two thirds of the original Wailing Wailers, Peter Tosh and Bunny Wailer quit the band to pursue solo careers. This caused the band to change their name again. This time to Bob Marley and the Wailers. The departure of the two members created a hole in the backing vocal section, this hole was filled and then some by the IThrees (Rita Marley, Judy Mowatts and Marcia Grittiths). That summer the band started a new European tour. Two of those shows were at the Lyceum Ballroom, both shows were considered among the top of the decade. Both shows were recorded and made the album "Live!" which included the unforgettable live version "No Woman No Cry" which was a world wide hit. The band underwent more changes with the addition of Al Anderson and Bernard Harvey who were later replaced by Junior Marvin and Tyrone Downie. The last time the original Wailers ever played together was at a Stevie Wonder concert for the Jamaican Institute for the blind. Bob Marley and the Wailers continued their roll releasing the incredible album "Rasta man Vibration" in 1976. This capped off a type of ReggaeMania happening in the states. Rolling Stone named them band of the year. On the Rasta man Vibration album was the powerful track "War" which lyrics came from a speech given by Emperor Haile Selassie. Bob Marley decided to play a free concert at Kingston's National Heroes Park on December 5, 1976. The idea behind the concert was a peaceful message against the ghetto wars happening in Trenchtown at the time. Tragedy struck two days before that he get on stage, gunmen broke into the Marley home and shot at Bob, Rita, and two friends. Luckily no one was killed. Despite this Bob Marley went on to put on a memorable show two days later at the Smile Jamaica concert. Following the show the band left for the UK. While they were there they recorded 1977's "Exodus". Possibly their best album to date, it solidified the band's international stardom. It went number one in many countries including England and Germany. It was also one of the top albums of the year. During their European tour, the band did a week of shows at the Rainbow Theatre in London. It was at the start of the tour when Bob injured his toe playing football. It was later diagnosed as cancerous. Also during this tour Bob received a very important ring, who's previous owner was the Ethiopian Emperor. In May Bob was informed of his cancer. His cancer would most certainly be taken care of by amputating the toe but Bob refused. To do so would be against his Rastafarian faith. With this news the remainder of the Exodus tour was cancelled. His illness didn't prevent him from recording music though, 1978 saw the release of "Kaya" which had a much more mellow sound then previous albums. 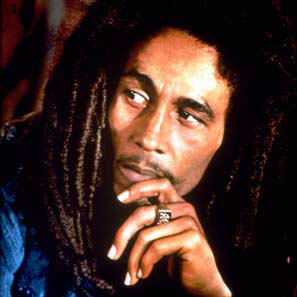 Bob was accused of selling out because many of the songs were love songs or tributes to ganja (marijuana). Rastafarians believed the smoking the holy herb would bring them closer to Jah (god). In April 1978, Bob returned to Jamaica to play the One Love Peace Concert. In attendance was Jamaican President Michael Manley and the leader of the Opposition Edward Seaga. It was Bob who got them on stage and even got them to shake hands. On June 15 he was awarded the Peace Medal of the Third World from the United Nations. For the first time he visited Africa going to Kenya and Ethiopia. On this trip he started to work on the song "Zimbabwe". The band also released their second live album "Babylon by Bus" with was recorded in Paris. The album which followed it was Survival in 1978. Throughout the album the theme of black survival was evident. The Seventies were now coming to a close, Bob Marley and the Wailers were the most popular band on the road breaking many festival records. In 1980 the band found themselves in Gabon to perform in Africa for the first time. Here Bob Marley discovered that there manager had defrauded the band, Bob gave him a beating and fired him. The Zimbabwean government invited the whole band to perform at the countries Independence Ceremony in April. Bob later said of the invitation to be the biggest honour of his life. After the amazing honour and experience Bob Marley continue to record, "Uprising" was released in 1980. Everything was looking bright, the band was planning an American tour with Stevie Wonder for that winter. Bob's health was deteriorating, but he still got clearance from a doctor to go on the road. The tour started with Boston, followed by New York. During the New York show Bob's looked very sick and he almost fainted. The next morning on Sept. 21 while jogging through Central, Bob collapsed and was brought to the hospital. There a brain tumour was discovered and doctors gave him a month to live. Rita Marley wanted the tour cancelled but Bob wanted to continue on. He played an unforgettable show in Pittsburgh but was too ill to continue so the tour was finally cancelled. It would be the last show he ever performed. Treatment prolonged his life somewhat but the inevitable was soon to happening. Bob was transported to a Miami hospital where he was baptized Berhane Selassie in the Ethiopian Orthodox Church on November 4. In a final attempt to save his life he underwent a controversial treatment in Germany. While in Germany he celebrated his 36th and final birthday. Ultimately the treatment didn't work. Bob wanted to die at home so he was flown back. Unfortunately he didn't finish the trip, he died on May 11, 1981 in a Miami hospital. He was internationally mourned for and thousands showed up at his May 21 funeral to show their respects. In attendance wereboth the Jamaican President and the Leader of the Opposition. Bob Marley now rests in a mausoleum at his birthplace. After his death he was awarded Jamaica's Order of Merit. The Prophet Gad insisted on becoming the owner of Bob's ring. However, amazingly the ring the disappeared and still has yet to be found. Bob's mother said that the ring was returned to it's place of origin.